REYHANLI, TURKEY. 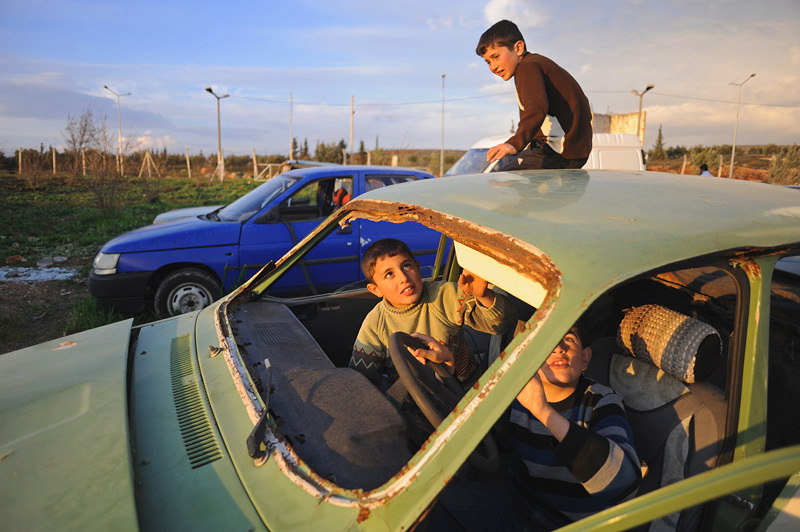 Syrian children play in a junkyard of old, abandoned and destroyed vehicles at the entrance to the Reyhanli tent city in Reyhanli, Turkey on February 26, 2012. As the year old rebellion against the rule of Bashar Al-Assad continues just across the border in Syria, Turkey has seen a continued influx of refugees from the Syrian conflict but has not granted them refugee status and instead considers them to be "guests" of Turkey; Turkey's border with Syria is just one hour from the Ceyhan Marine Terminal where the Baku-Tbilisi-Ceyhan oil pipeline ends its 1,100 mile journey at the Mediterranean port.